As time goes on, more and more companies are “going green” in an effort to promote environmental sustainability. This also means that more companies are developing and offering green cleaning supplies. We carry brands that include Green Works®, Simple Green®, Clorox®, Lysol®, Zep®, Citrus Magic®, Mr. Clean®, 409®, and Pine-Sol®. At Aactus, we know the importance of environmental sustainability as well as the increased safety for people and animals that comes with the use of green cleaning products which is why we have a growing selection of green cleaning supplies that we have in-house. 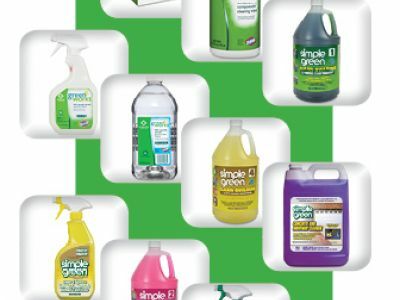 We stock everything from cleaning wipes, glass and multi-surface cleaners, all-purpose cleaners and disinfectants to toilet bowl cleaners, heavy duty cleaners and degreasers, and concentrated cleaners and disinfectants. All of the green cleaning supplies we offer are non-abrasive, non-toxic, non-flammable, and are all volatile organic compound (VOC) compliant. At Aactus, we are not only a green cleaning supply company, but also offer tens of thousands of products and services – seeing growth every year despite NOT being an e-commerce company. Our mission is to seek to improve our customers’ bottom line by offering expert advice on industrial supplies, carrying products that deliver excellent value and providing an unmatched level of service, on-time, the first time. While our corporate headquarters complete with public showroom, offices, and our main warehouse is located in Livonia, Michigan, we also have satellite warehouse locations nationwide that help us fill most of our customer orders with 24 to 48 hours.